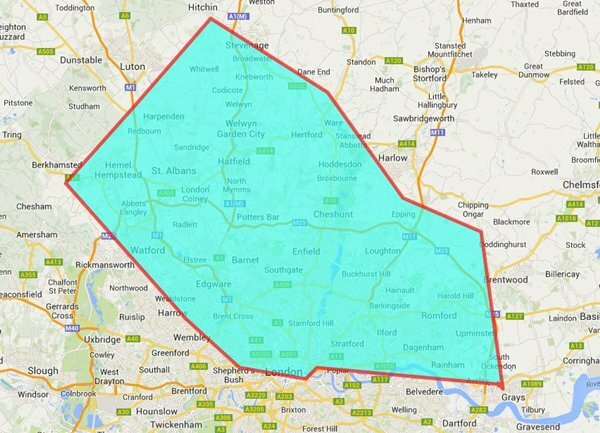 I COVER ALL POSTCODE AREAS IN NORTH, EAST AND WEST LONDON. LOUGHTON, HARLOW, EPPING, ROMFORD, AS FAR AS GRAYS. I ONLY CHARGE FOR THE WORK INVOLVED NO TRAVEL COSTS INCURRED. I WILL TRAVEL TO THE CITY ON SATURDAYS AND SUNDAYS AS THERE IS NO CONGESTION CHARGE AND PARKING IS EASIER. PLEASE NOTE ANY PARKING FEES ARE DISCUSSED WITH THE CUSTOMER.